I have heard it said that growing old stinks. The creaks and groans in the joints and the general wear and tear on the body and mind take their toll as the years march by. But those things are not what I think of as I grow older. What I think of most is how little my children need me anymore. My birthday and Halloween are always the same week so reflecting on aging is natural even though I still feel young. Oh sure, the little aches and pains that I never had before are no fun, but the pain I feel when I think about my kids growing up is more heart wrenching. Do not get me wrong. There are days when I am ready for the boys to move out. When their push to be independent gets to me and I want to just throw my hands in the air and say, “I quit.” But being a parent is more than full time and I cannot help but keep trying to do my job however old they get. And it is a job that I will never quit doing. Regardless of whether they want me to or not. I suppose this growing old thing has gotten me a little melancholy this year, but it also brings with it smiles and resolve. I love to carve pumpkins. We used to do it when I was a kid and we used to do it every year when the boys were growing up. The past few years though have brought a drought of pumpkins. Thing 3 has been a tween or teen and could not be bothered with such things. Thing 2 is always busy busy busy, so even if he wanted to carve pumpkins, his schedule has left him with little time on his hands. Thing 1 is on his own and works a different schedule every week. All of these circumstances have let the pumpkin carving fall off the schedule of life events. Which was probably the biggest reason for my Halloween melancholy this year. But no more. No more crying in my own soup. No more wishing the kids were younger. No more feeling sorry for myself. I have decided that age does have its advantage. Even though I am not an old dotard (I know that is redundant), I can exert some of my age privileges. 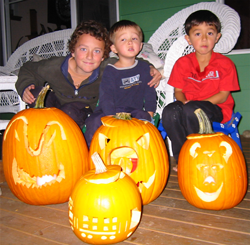 I can tell my children that I need them to carve pumpkins with me. I can tell them that I need them to play games with me. I can tell them that they just need to come visit their dear old dad. And I am not going to wait any longer to do it. I am going to exert my privilege on my children because I do not want to just relive old memories. I do not want to look longingly at old pictures of our Jack o’lanterns and other carved masterpieces and wonder where the time has gone. Neither do I want to rent children to take out trick or treating. (I do not miss the cold and wet Halloween nights prevalent in the Northwest.) All I want to do is spend some time with my family. Carving pumpkins. We will not have those pumpkins carved and ready for Halloween night this year, but I am through with this pity party I have been throwing for myself. My kids are going to be as busy as ever, but I am still going to invite them to spend time with me. And we are going to carve pumpkins or play games on my birthday (or before). Every year. If I can remember. I suppose getting older does have its privileges. Even if those aches and pains and creaks and groans are more frequent. Even if one foot is in the grave as they say. I for one am not going to lament any longer. Even if they are right and growing old really does stink.